The Rosamund bag returns... handbags at dawn, people (oh, and a competition)! As we're all about full disclosure here, we have to tell you up front that the L.K. Bennett Rosamund Bag has been a favourite for 2013. I have carried my orange Rosamund to death and been met with compliments and enquires everywhere I go. At one point I considered giving up and just tattooing L.K. Bennett on the outside to keep the questions from rolling in. This is a bag that looks, feels and acts expensive. How does a bag act expensive? Well, it ticks all the boxes for carry needs while also maintaining its shape and colour - and drawing attention from every fashion forward thinker on every city sidewalk. ‘Since we launched The Rosamund Collection this Summer, the design continues to be a consistent strong seller both UK and Internationally. It’s an ongoing collaboration, with Rosamund Pike being hands on with all forthcoming ideas and colours. She wanted to create a real modern classic, a here-to-stay, bag for life – using all the hallmarks of true luxury (specifically hardware & leather) with an accessible price-point’. It's always good to hear you are in good company. Now onto the good news for the new season. The Rosamund is returning. Yes, it's done so well it's getting a repeat performance. 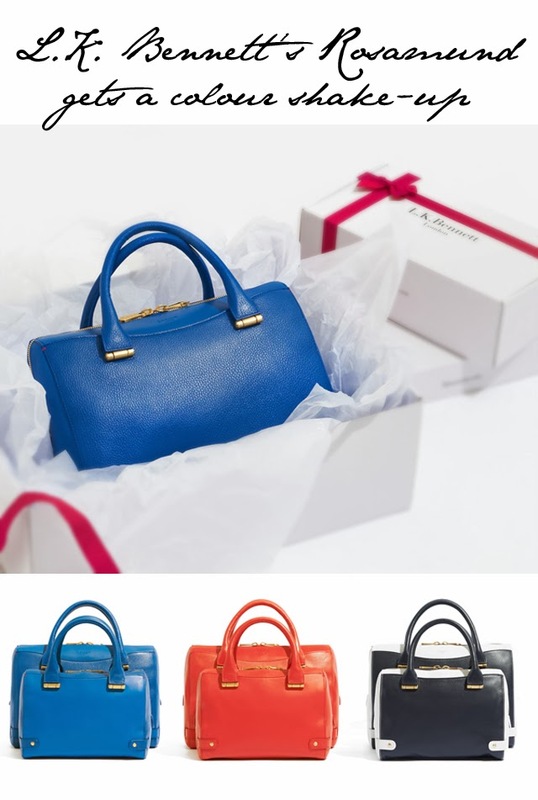 For Spring Summer 2014 the bags are now in a range of vibrant colours ranging from vibrant coral to nautical navy/white. They continue their heritage of being made in Italy with soft calf skin and contrasting grained leather. Bliss in a bag! Now you may have seen we mentioned a competition. Well, all I can say right now is that it's coming on Monday and it has to do with this fabulous new collection. So if you fancy getting intimate with a Rosamund bag, make sure and check back first thing Monday. Trust us, you won't regret it!